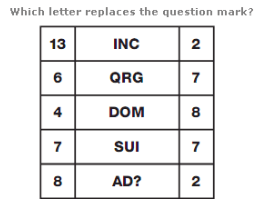 By using your logical reasoning skills please try to figure out which letter is missing in the questions below. The letters around will give you the clues you need to solve the puzzle. Starting on the left, and moving along the line to the right, letters follow the alphabetic sequence, in steps of 1,2,3 and then 4, before repeating the sequence. 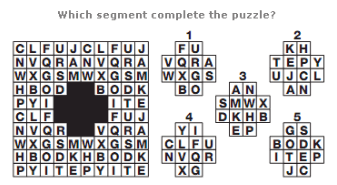 Splitting the large square into quarters, each quarter features the same pattern of letters. 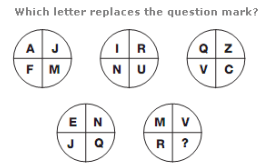 Starting in the top left circle, and following a W pattern through the others, letters in corresponding segments of the circles follow the alphabetical sequence in steps of 4 letters. Working from left to right, letters move forwards 7 places, then back 2. Repeat this sequence until the end. In each row, the product of the left and right hand numbers equals the sum of the numerical values of the three letters.